This is My Boy last week. He received 3 awards at school. He was proud of himself and of course it's awesome to mom and dad. What's sweet is that afterwards he was so excited that his best buddy got an award too! He has always been so compassionate! This is DQ, she also received many awards last week, including Principal's honor roll (all A's) and a reading award for 500,000+ words read in a certain reading program! Our kids SO rock! Way to go! they actually give LETTER grades there? totally numbers here until you are in middle school/high school. kids go through k-8 school so ALL get numbers just based on standards. congrats to DQ and Your Boy. no one here even made honor roll the 1st trimester lol it was shocking for me cos mini-me usually does. Yay for your kids, that's awesome!! Great job to both of them, for their awards! That's so funny about DQ! Congrats to your kiddos and to momma! That's awesome. 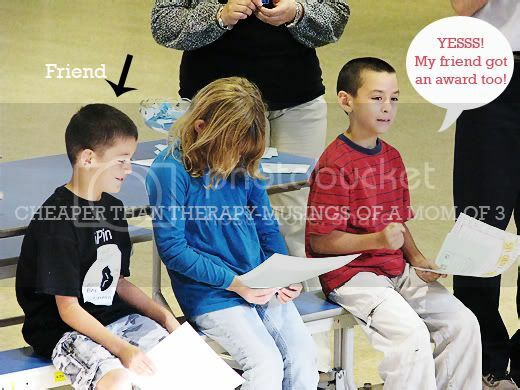 very cute, love that his friend was excited for him. Super cool! Its the best feeling when your kids do great!! I love that "Yesssssssssssss" shot. look at your smart little cookies! Great job guys! YAY! Congrats to your kids!! How sweet he's excited for his friend! Way to go on the awards!! awww.. what a good friend he is!!! Way to go My Boy and DQ!!!! Nice job Mom...you must be doing something right!!! congrats on the awards!!! Woohooo!!! AND way to go mom! Because as moms, we are teachers too--as of yesterday, I am now an expert at teaching contractions and how to use apostrophes! THAT'S GREAT! I want to know what he said to the little girl sitting next to him to make her cry though. Is that Captain Caveman sitting between those 2 boys? hmmm, could be my Hairy #2's mini me! Thanks! 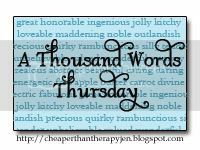 My first Thousand Word Thursday...I 'm going to enjoy this!! Look at both of them. Is she trying to hide her excitement? Too precious! Awards are awesome! Congrats My Boy and DQ! Oh you have some smart kids over there - go Momma! Kids are so amazing. Congrats on the fine parenting. Congrats, you have lots to be proud of! Jobs well done! My favorite days were Awards Assemblies when I was teaching. I loved seeing the kids' faces and their proud parents in the audience :) Grats to you & the kids! way to go! they look great! That is great that they are doing so good and how sweet for your boy to care about his friend too! Do you manually put your watermark on your pictures or can you automate that? That's so great! My son gets his award on Monday! So excited for him! You know who else rocks? You do! Thanks for adding me...your the best! Congrats to your kiddos on their awards. I good work to you and your hubby! Awards rock. Especially those for friends. My son Miles wanted to watch the video of your son drawing the names of the winners of the books about 80 times. I finally had to put a stop to it. He thinks he's REEEAL coool. Wow, that's great! You must be so proud!! Keep it up kids!! Yes-they DO rock!! It's so obvious how proud you are...go Mom!! That's awesome! Great job, kiddos! Congrats kiddos! And what's with the hair on that middle one? 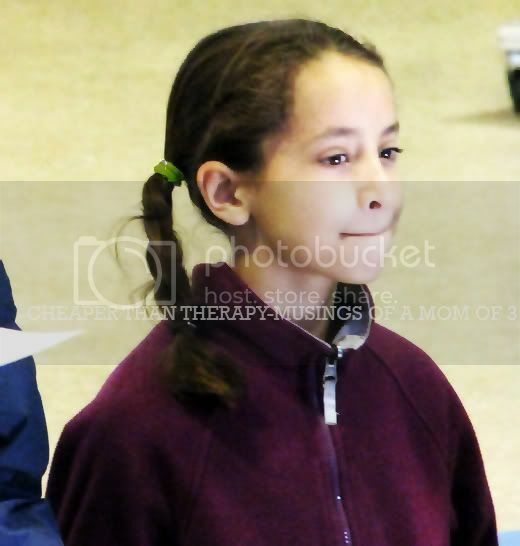 We need a barrette STAT!! That's awesome! I'm sure you and hubby are so proud. Tell the kids congrats from us! Very proud moments. Congrats to your kids.